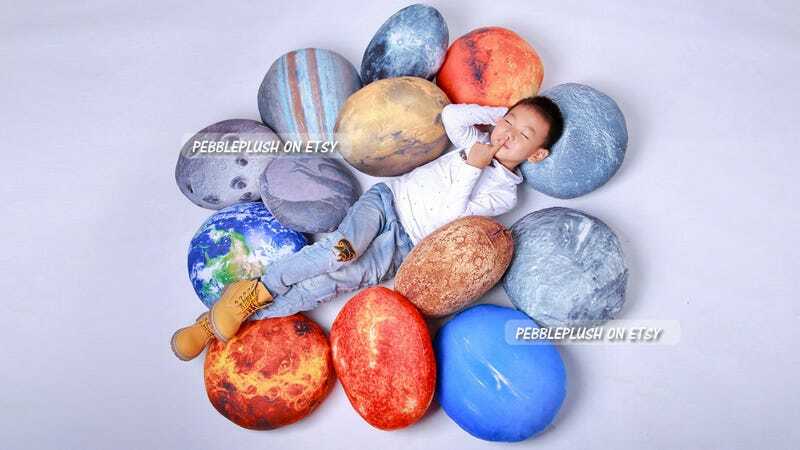 Instead of worrying about whether your throw pillows complement the colors in a room, head on over to Etsy where PebblePlush has a created a set of 12 pillows that look like the planets and other celestial bodies in our solar system. Science matches any decor, and you might even learn something. In addition to all the planets, the set also includes the sun and the Earth’s moon, but at 18-inches in size, they’re definitely not to scale. Otherwise our closest star would be a pillow about the size of a sports stadium, which would be amazingly comfortable, but tricky to ship. Because they’re made to order, each set costs a hefty $379, but you can also buy the planets individually which run from around $20 to $50 depending on the size, allowing you to customize your own solar system. Do you really want to be sleeping next to Uranus?